Given that environmental factors can alter developmental trajectories (think queen bee), it's not surprising that changes in the DNA sequence of developmental genes will do so as well. In fact, as you probably can guess, small changes in developmental genes can have tremendous impact on the adult organism. Take flies that have grown legs where their eyes should be (see Figure 14-1). This example is a little bit Frankenstein-like (and not too good for the poor fly that happened to have this mutation), but it's a wonderful example of a small change in development that has a big change in morphology. What the fly example shows is how small mutational changes in regulatory systems can influence the diversification of multi-cellular organisms. Scientists had been struggling to reconcile how the small mutations we see all the time — a DNA letter or two changed here, a few bases deleted there — could result in major changes in body plan. Now scientists know from laboratory evidence that tiny changes in DNA sequence can have major implications. With the fly, scientists noticed the mutation and tried to figure out what had happened. 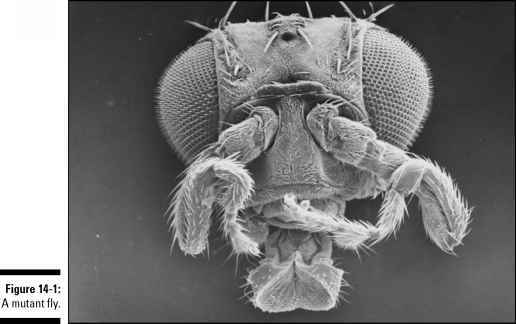 What they discovered was that a single mutation in a gene that acts early in flies' larval development results in antennae where eyes should be. In other words, while this fly was still just an innocent little maggot, the pattern of development that resulted in the adult fly had already been determined. A small change in a single gene involved in development can cause a large change in the final phenotype.